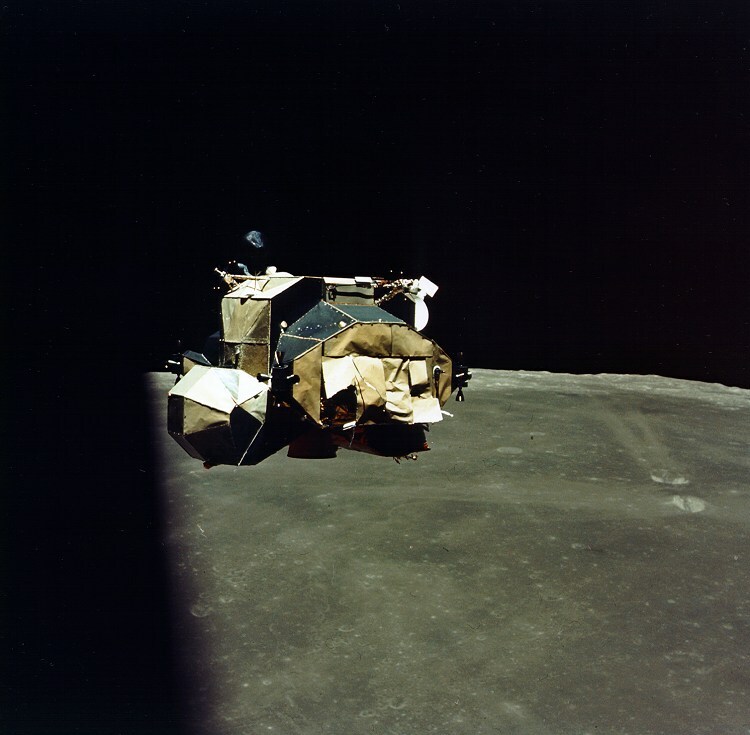 This entry was posted in Apollo, Space and tagged Apollo 16, Grumman, Lunar Module. 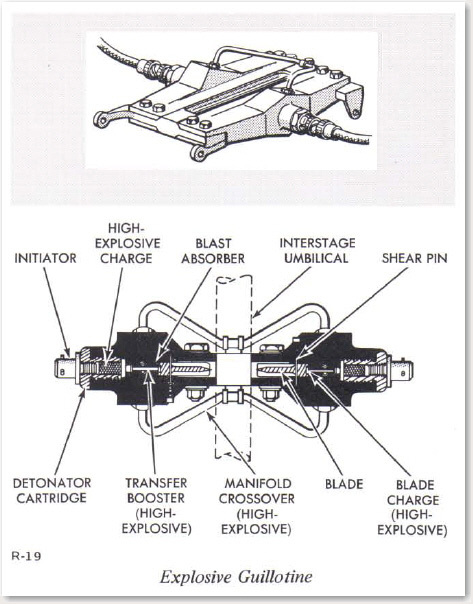 I enjoyed your post about the explosive guillotines in the Lunar Module. It made me wonder about the interface between the descent and ascent stage. Did the ascent engine fire directly into the descent stage? Or was there a hole for the ascent engine to vent through? Yes, the ascent engine did fire directly into the descent stage. Above the descent engine was essentially an empty box. 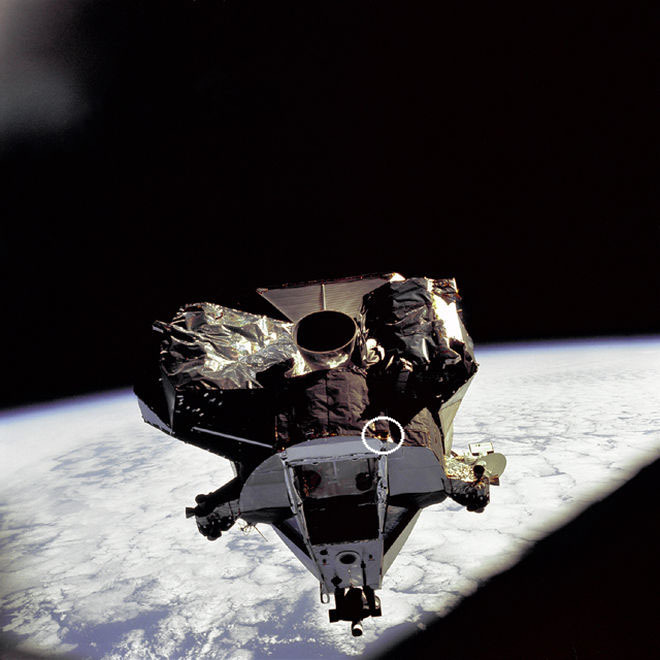 You can see in the Grumman photo below of the Apollo 13 descent stage that there was some thermal shielding above the descent engine, but that was in-flight shielding only and not meant to protect during lunar liftoff – no need since the descent stage’s work was done. 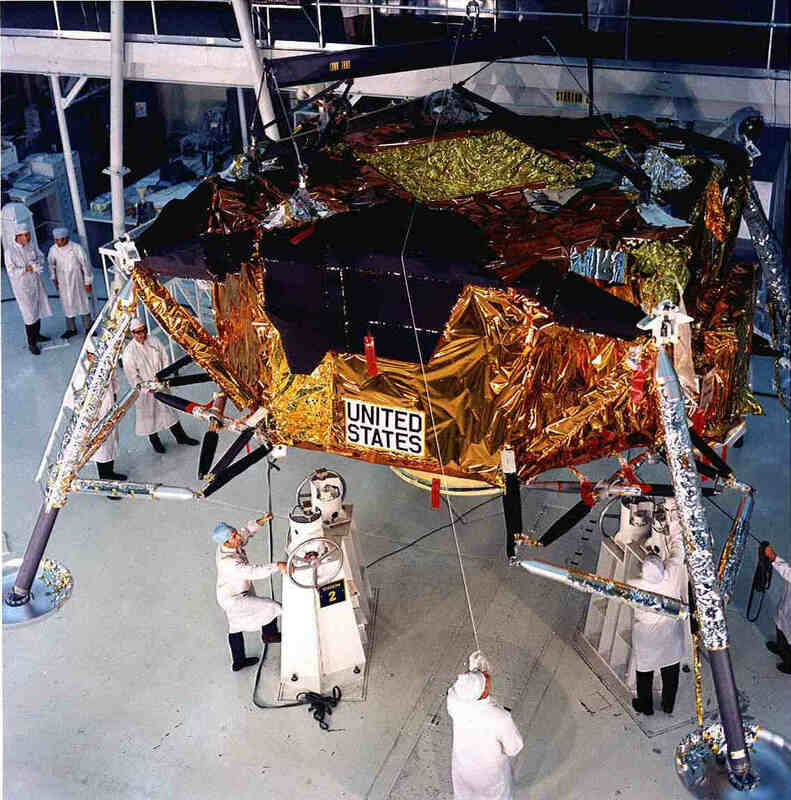 The dip in that shielding, which looks to me to be at least 18″ deep, was to accommodate the ascent engine bell. 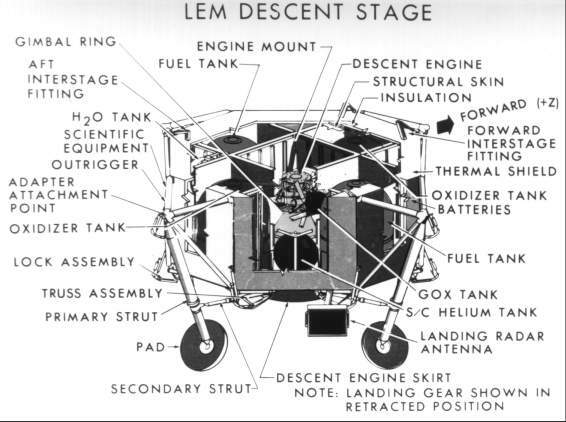 There was a good amount of exhaust blowback during lunar liftoff, hence the dozens of bits of shielding you see flying off the descent stage in the Apollo 15, 16, and 17 lunar liftoff videos – most of which was from right under the ascent engine – and the damage sustained on the rear of Orion‘s ascent stage during Apollo 16. Thanks for the answer lalmon! I suppose, if anything, an initially restricted exhaust space, would increase the ascent thrust a tiny bit. That “empty box” gap you speak of must’ve been sturdy. Certainly stronger than the engine bell of the decent stage that was designed to buckle and actually did on Apollo 15. 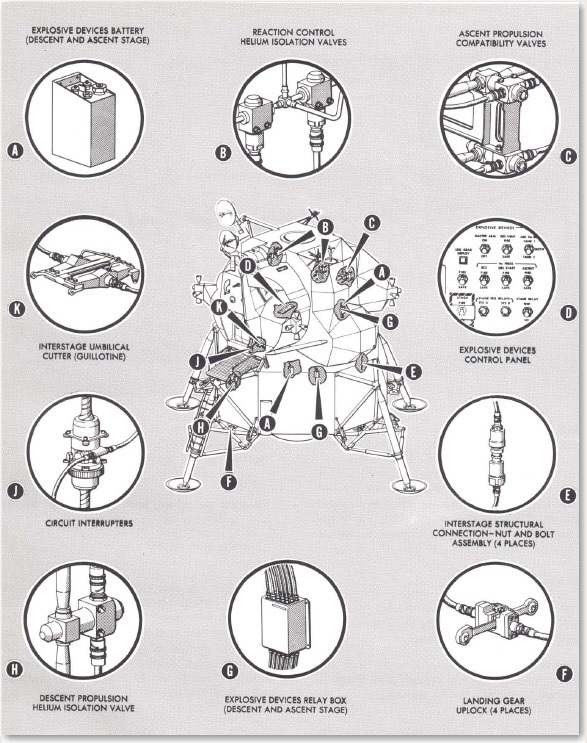 Watching the amazing series Moon Machines (available on Youtube), you really have to feel for the lunar module designers. In particular they were sick with fear the ascend engine might have a problem, with little the astronauts could do about it. Due to the highly corrosive hypergolic fuel used in both LM engines, they couldn’t test fire the actual engines used before hand. They were fired for the first time on the Moon! Hear the engineers talking here. Can you imagine if everything worked perfectly except the guillotine… I bet the engineers who created it couldn’t prevent that hideous mental image! I was the designer of the attachment system for the Guillotine and its related systems. 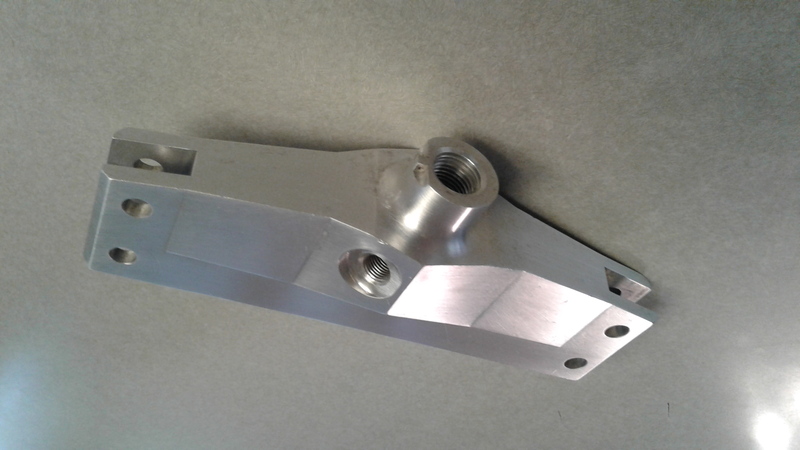 It was attached to the bottom of the Ascent Stage lower shielding structure. Some NASA drawings are incorrect showing it on th forward end. The designer of the Guillotine was Gene Tiefenworth. He and I worked together to make sure the system met the structural, thermal and micrometeoroide protection necessary for a safe space flight. Many of us watched with baited breath the first Lunar departure and were very much elated when everything worked as expected. I was just 27 years old at the time, but never had such a great event happened in my aerospace career that spanned 43 years in total. Thanks for that information, Carlos. I must say that in my hundreds of thousands of pages of Apollo study, I’ve never seen a drawing or photo showing exactly where it was. It looks like one of my comments is wrong – from my reading, I did think it was at the forward end as pictured above. I can imagine how thrilling it was to see it work flawlessly – and six times at that. My hat’s off to you. I think we haven’t ever done anything even one quarter as exciting as Apollo. It was like living in the future when I was a kid – I was two weeks shy of ten years old on 20 July 1969. What was in your notebooks? I worked at McDonnel Douglas in St. Louis in the 80’s as a designer. I did not know anyone who had a notebook. Sounds like a good idea. We had The Design Handbook and The Standard Parts Manual. I once had to look up the structures analysis handbook on one part from more than 10 years prior to find out why, with all the other formers being made out of sheet metal, there was one that was machined. It was the only page that did not start with the Free Body Diagram in the upper right corner of the page. And sure enough, one of the first equations had the direction of a force in the wrong direction. At Georgia Tech, we were taught to always put up that diagram. It was worth like 2 problems’ worth of points on a test. But I did not see any design notebooks. As to the former. In the end, we left it. The new, better, engines made the aircraft a little tail heavy anyway, and it was not worth it to change the other parts to save a couple of ounces. I mean, a couple of hundred grams. That’s pretty cool. Say, what are the dimensions of the housing? It’s never been clear to me from any drawing, but my guess has been something like 8″ wide. Before the the guillotine was activated the battery power between the descent and ascent stages had to be disconnected along with other circuits. This was done done via two Deadface connectors which were also actived via pyro devices. 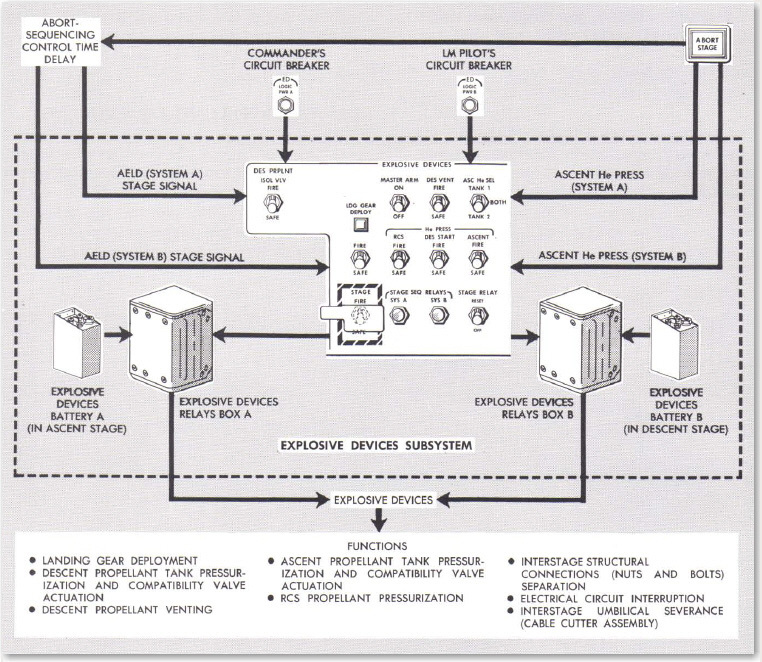 The separation sequence was quite complex.